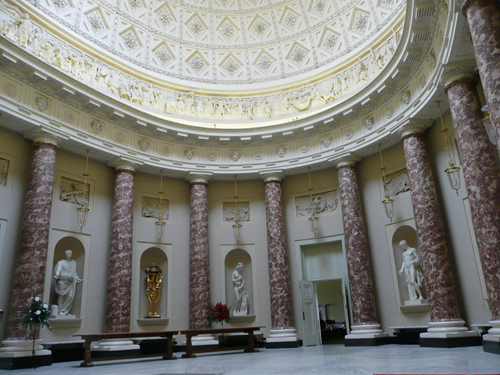 Stowe House is a magnificent Grade I listed eighteenth century country house located in Stowe, Buckinghamshire. 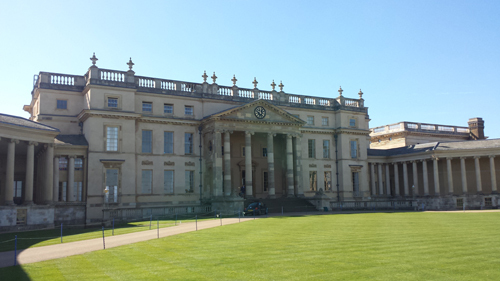 It is the home of Stowe School. The gardens (known as Stowe Landscape Gardens), a significant example of the English garden style, along with part of the Park, passed into the ownership of The National Trust in 1989 and are open to the public. The house is open to the public at certain times. a)	1677-1683 under Sir Richard Temple, this involved the building of the central block. b)	1720s-1733 under Viscount Cobham, including the addition of the North Portico by Vanbrugh and the rebuilding of the north, east and west fronts. c)	1740s-1760 under Viscount Cobham, the expansion of the both the western and eastern state apartments. d)	1771-1779 under Earl Temple, in 1771 Robert Adam produced a new design for the south front, this design was adapted and made more uniform by Thomas Pitt and was finished in 1779. The interiors of the new state apartments were not completed until 1788. The Temple family acquired the estate in 1593. In 1677 Sir Richard Temple, third baronet (1634-97), built a brick house, which remains the core of the existing building. 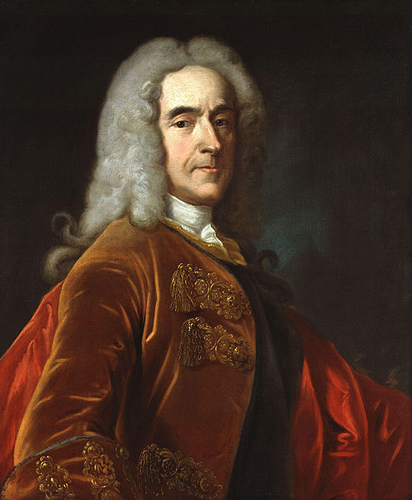 His son, also Richard Temple (1675-1749), inherited the house in 1697. He was a soldier, rising to the rank of Lieutenant General, and finally becoming Viscount Cobham in 1718. He brought in John Vanbrugh, who extended the house, and Charles Bridgeman, who carried out extensive landscaping of the estate. Stowe was inherited by Lord Cobham’s nephew, Richard Grenville (1711-79). He soon became Earl Temple and was described as being the richest man in England. Much of this wealth was used to enhance Stowe – the existing north and south fronts and most of the interiors date from this time. Earl Temple’s nephew, George Grenville (1753-1813), inherited the house in 1779. After two spells as Lord Lieutenant in Ireland he was made Marquess of Buckingham. His eldest son, Richard (1776-1839) achieved the family’s long-standing ambition of a dukedom, being made Duke of Buckingham and Chandos in 1822. By the end of his life overspending had led to a number of economies, which resulted in the sales that started in 1833 and the house being shut up. The second Duke inherited his father’s extravagance and became known as the “Greatest Debtor in the World”. His debt was such that in 1848 the contents of the house were sold over forty days and shortly after he occupied a Grace and Favour apartment at Hampton Court. Richard, the third Duke (1823-89) attempted to restore the family’s fame and fortune by taking on a long list of public appointments. He died unexpectedly in 1889 and most of his titles either died with him or transferred out of the immediate family. His daughter, Lady Kinloss, was prepared to sell Stowe on her father’s death, but no buyer could be found. She, therefore, let the house to the Comte de Paris, the claimant to the French throne. He died in 1894 and the house was again empty until the widowed Lady Kinloss occupied it from 1901 to 1907. Her eldest son, the Master of Kinloss, inherited the house in 1908, but he was killed in the first year of the Great War. Stowe passed to his brother the Rev. the Hon. Luis Morgan-Grenville, who put it up for sale in 1921. The buyer was a Mr Harry Shaw, who had hoped to present the house to the nation. However he was unable to raise the necessary endowment and was forced to sell it the following year. Stowe School has been the guardian of the house since 1922. Since that time some of the family portraits and other items associated with the house have been bought back and are now on display in the house. 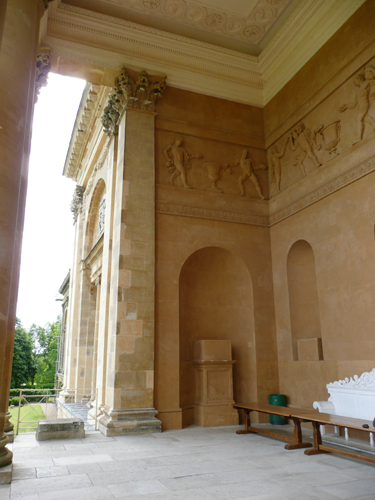 Unable to continue with the maintenance and restoration of the house and garden, the School gave Stowe Landscape Gardens to the National Trust in 1989. In 1997 the Stowe House Preservation Trust was founded with the responsibility for repairing and presenting the house. With the assistance of the Heritage Lottery Fund, English Heritage and the World Monuments Fund amongst others a major programme of restoration is now taking place. This has been a massive project that saw me carrying out the analysis of the paint in a number of the fine rooms. Individual essays can be seen on the following – the State Dining Room; the State Music Room; the State Drawing Room; the Library; the North Hall; the Blue Room and the Queen’s Temple.